Dimensions 1.25 by 5.25 by 8.25 in. The Weather Makers is both an urgent warning and a call to arms, outlining the history of climate change, how it will unfold over the next century, and what we can do to prevent a cataclysmic future. For the first time, a scientist provided an accessible and comprehensive account of climate change, writing what has been acclaimed by reviewers, scientists, and policy makers around the world as the definitive book on global warming. Reprint. An international best seller embraced and endorsed by policy makers, scientists, writers and energy industry executives from around the world, Tim FlanneryÃ¢ÂÂs The Weather Makers contributed in bringing the topic of global warming to national prominence. For the first time, a scientist provided an accessible and comprehensive account of the history, current status, and future impact of climate change, writing what has been acclaimed by reviewers everywhere as the definitive book on global warming. With one out of every five living things on this planet committed to extinction by the levels of greenhouse gases that will accumulate in the next few decades, we are reaching a global climatic tipping point. The Weather Makers is both an urgent warning and a call to arms, outlining the history of climate change, how it will unfold over the next century, and what we can do to prevent a cataclysmic future. Originally somewhat of a global warming skeptic, Tim Flannery spent several years researching the topic and offers a connect-the-dots approach for a reading public who has received patchy or misleading information on the subject. Pulling on his expertise as a scientist to discuss climate change from a historical perspective, Flannery also explains how climate change is interconnected across the planet. This edition includes an new afterword by the author. About: A history of climate change, how it will unfold over the next century, and what we can do to prevent a cataclysmic future includes specific suggestions for both lawmakers and individuals. About: A history of climate change, how it will unfold over the next century, and what can be done to prevent a cataclysmic future includes specific suggestions for both lawmakers and individuals. 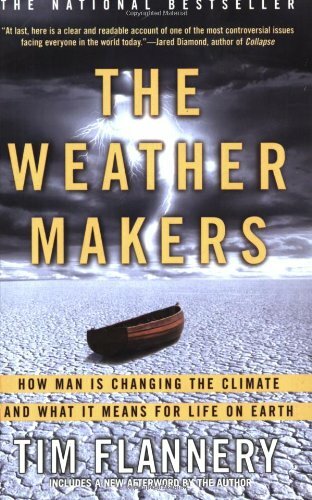 About: An international best seller embraced and endorsed by policy makers, scientists, writers and energy industry executives from around the world, Tim Flanneryâs The Weather Makers contributed in bringing the topic of global warming to national prominence.